Above All, Who Did Christ Die For? These words, the chorus of the song “Above All,” have echoed in evangelical churches far and wide. On the whole I like the song, it’s first two stanzas testify to the universal sovereignty of God. However, as it enters the chorus, the sweeping sovereignty of God appears to be displaced by a form of sentimentalized love that is all too common in our self-exalting century. The theological problem that some have with this song comes at its climax, the point that the whole song drives towards. In that final line, “Above All” ostensibly leaves the high ground of God’s sovereignty (“above all kingdoms / above all thrones / above all wonders the world has ever known”) to frolic in the marshes of ego-boosting self-esteem (God “thought of me above all”). Intended to express breadth, length, height, and depth of God’s unfathomable love, Michael W. Smith’s lyrics come close to severing the root of God’s love by leading the chorus to sing that God in his love thought about me “above all.” I say close, instead of actually committing the act, because I think upon closer inspection “above all” in the chorus should be delimited by the earlier “all” statements. Tomorrow, I will show how I think “Above All” can serve as a God-exalting worship song, but today let me unpack the theological truth that has led many to take issue with this song, namely that the highest purpose of the cross is not directed towards man, but towards God himself. Until the bitter end Jesus obeyed his heavenly father. He fulfilled the will of God, drinking the bitter cup to its very last drop, so that in perfect submission to his father, he could become the spotless lamb of God, sacrificed for the sins of the world. In his perfect obedience, Jesus thoughts were preeminently Godward, even as his dying faith remembered the joy of redeeming the people God had given him (Heb 12:2). The root of God’s love for humanity rests not in humanity’s loveliness; it rests in the fact that God in love sent his Son to expiate our sin, such that sinful creatures could know and experience his infinite love. Propitiation came by expiation; reconciliation came through justification; love came through sacrifice. God’s love is defined by Christ’s sacrifice (1 John 3:16), and the merit of his sacrifice depended on Christ’s perfect obedience to God—which included loving God the Father above all earthly things (cf. Matthew 22:37). In his death, Jesus accomplished the purposes of God on the cross, but in so doing, he kept God as the central focus of his passion. And thus, it is errant to say that Christ thought about me more than God on the cross. Were Jesus to do that, he would be an idolater. And he would no longer be able to be worthy of worship, nor capable of saving us. For this reason, we must give serious consideration to the words of Michael W. Smith’s song and ask: Does it mean that Christ literally thought about me more than God while he died on the cross? Christ died first and foremost for God, and Scripture makes that point plain. So important is this reality that often times, Christ’s death is referred to simply as his obedience (Rom 5:19; Phil 2:8; Heb 5:8). In the history of doctrine, obedience has been used to speak of Christ’s perfect life (active obedience) and atoning death (passive obedience). While we must be clear to understand Christ’s passive obedience to refer to his passion, not his passivity in death, John Murray is right when he says obedience is “embracive enough to be viewed as the unifying and integrating principle” of Christ’s atonement (Redemption Accomplished and Applied, 19). More exegetically, it is apparent that John wants to demonstrate Christ’s obedience to the Father throughout his Gospel. So the beloved disciple emphasized this theme in many different passages: Jesus did the works of the Father (5:19–20, 36; 10:25, 32, 37–38) and fulfilled the will of Him who sent him (4:34; 5:30; 6:38–40). In this way, Jesus was perfectly attuned to his Father’s will. Even from the earliest age, Jesus was concerned with pleasing his heavenly Father, even when it caused his parents grief (Luke 2:41–51). This all-consuming attentiveness to God earned the Father’s blessing (Matt 3:17) and continued until his death, as Jesus’ suffering proved his perfect obedience (Heb 5:8). All in all, Jesus’ perfection, and his ability to give salvation (Heb 5:9), is directly related to his unswerving faith and commitment to his Father’s will. Even while dying in the place of others, Jesus died in obedience to God’s Word (Luke 24:44), thus securing the blessing of those sinners who would be justified by faith in him. Therefore, Jesus could not have died above all for you and I. Above all things, he died in obedience to his Father. This, as John 17, says supremely glorified the Father and secured the salvation of those saints whom the Father had given the Son before the world began. To summarize our observations, Christ’s obedience unto death was the supreme revelation of God’s glory. God glorified his Son through the cross and Christ glorified the father by doing all that he asked. Accordingly, God exalted his Son to his right hand and rewarded him with a people. From our perspective, we experience the glory and love of God by being the gift promised by the Father to the Son in eternity past, purchased by Christ in time and returned to the Father for the age to come. As John 17 indicates, Jesus’ first focus on the cross was the Father. 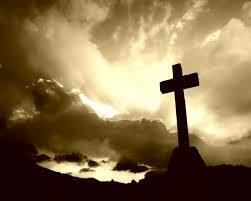 If, on the cross, Christ thought of me above all things including God, he would have been an idolater. He could not have pleased the Father. He could not have been the sinless sacrifice, for in his dying moments he would have placed humanity above God himself, thus nullifying the exquisite gift of his life for his bride. But, praise be to God, Jesus thought of his Father above all things. Above all, Jesus obeyed the Father. But in so doing, he insured that those given to him by the Father (see John 6 and 17) would reach their eternal destiny—a world of love, promised by the Father, purchased by the Son, empowered by the Spirit, given to all who trust in the Son. This is the rock solid foundation of the gospel, and the reason why Jesus deserves all honor and glory—from the Father and from us. Above all things today, let us give him glory for the grace he has given to us in his perfect, Godward obedience.